Jimmy Carter’s presidency provided something of a bridge between the end of the Vietnam War era and the early Reagan years. A little more than a year into his presidency, in August of 1977, Carter asked Congress to make it illegal to hire undocumented aliens, increase enforcement of the Fair Labor Standards Act, allow undocumented aliens who had been in the U.S. since 1970 permanent resident status, and create a new temporarily resident alien status for undocumented immigrants who were in the U.S. before Jan. 1, 1977. The rough outline of Carter’s request came to fruition when Ronald Reagan signed the Immigration Reform and Control Act of 1986, which ultimately granted amnesty to around four million immigrants who had been in the country since 1982. 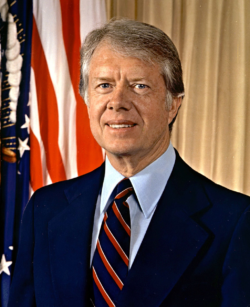 On March 17, 1980, Carter signed a Refugee Act, creating the Federal Refugee Resettlement Program to replace the series of ad-hoc presidential orders that had typified U.S. refugee policy in dealing with hundreds of thousands of Southeast Asian refugees who came to the country after the end of the Vietnam War. The act increased the annual ceiling for refugees to 50,000 from the previous 17,400. Carter was also president during the Mariel Boatlift, a mass migration of Cubans to the U.S. between April and October of 1980. The Boatlift was triggered by poor economic circumstances in Cuba coupled with Fidel Castro’s surprise decision to allow any Cubans who wished to leave the country to do so. Around 125,000 Cubans made the journey to Florida.